Living The Artist's Dream: We Survived Thanksgiving! And hope you did also!! This was our first RV Thanksgiving. It rained here straight for two days, not sprinkles, but heavy down pours. 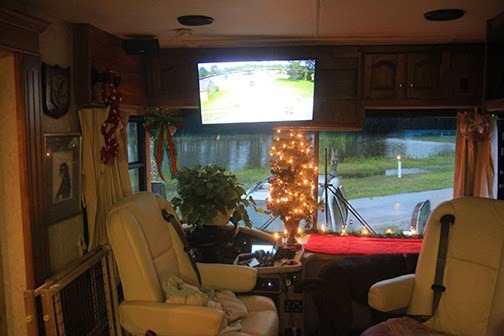 A few times I thought we would be becoming one of those RV's that can turn into a boat. So, to keep our spirits up, we decorated for Christmas!! We, I, haven't decorated for years. Our kids have grown and gone and holidays just made me sad. But this year there was an excitement. Having a new "life" and I heard our son Jamie was driving down from Minnesota! 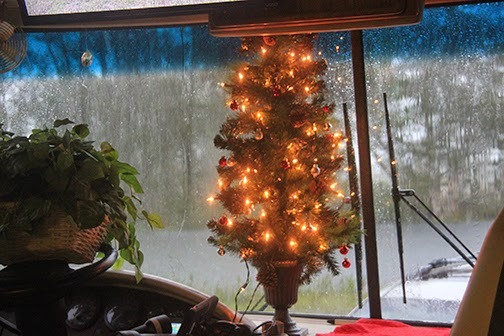 Roger found this little tree at Winn Dixie's, a local grocery here in Florida, and brought it home. 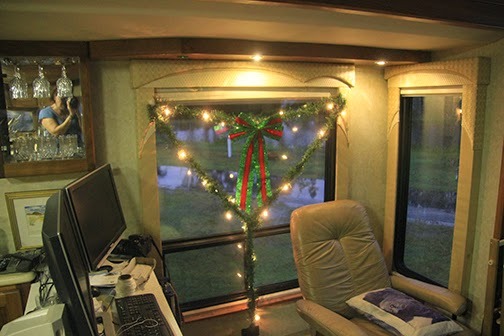 We added more lights and put it in the front window. You can see the deluge happening out the window. Roger went decoration hunting again and brought home strings of garland with lights in it so we hung it on our picture window. The plug outlet is straight down so the design was a little creative. The red towel is for Ozzie. He loves laying up on the front console watching for Roger to drive up. So Turkey day arrived along with Jamie, Stefanie, our daughter-in-law and Logan our grandson. We all went over and had dinner in the rec hall with about 20 other friends and strangers. After we hung outside with dogs and chatted. Yes the rain finally stopped but it was still wet and muddy. My feet were getting shriveled. haha. The day ended as it started to get cold and Roger and I went in to relax and chat about the day. That's when my eyes started to flood. The result of months of getting rid of possessions, a new home, letting one we had for 15 years go. I texted my daughter and told her and that I was so grateful Jamie had come for a bit of continuity. Don't get me wrong, I love my new lifestyle but I think it all just overwhelmed me. Amid the paper plates and sectional plates of the other RV,ers, we had colorful china plates. They will fit in the basement so I'm not concerned but I so needed that link of Family Ritual. I'm thinking for Christmas dinner I'm bringing candles for the tables. Who knows. maybe next Thanksgiving we can brave the cold and drive up to NH to have Thanksgiving there with our daughter. (However I'm reading the storm there this week knocked out power all over the place) sigh. Thanksgiving in July!!!!! We all went over the the hall last night to watch a movie which was fun but today I am hiding and recuperating. Being Black Friday I bought two stretched canvas for a commission that came in a few days ago then some plein air panels to try out. Roger is getting restless and wants to get back to painting again. Woohoo. I ordered some 5" x 7" panels for him. He does really colorful fun paintings of the Labs. Wait til you see.!! So, we survived!! Oh, funny story. At night when I take Lola out she pulls and barks into the dark towards the rec hall. The lights have been out due to the rains so I had been thinking she's afraid of the dark. She scared me so we run right back into the coach. Walking back to CiCi Blue this morning after being at the park she started pulling again and barking wildly at the tree right in front of the hall. I looked up and saw, curled up in one of the arms of the tree, a rolled up ball of fur. A Possum? Possible. We moved quickly by but now I know she is actually barking at something out there at night. I'll be walking from now on on the far side of the coach so I won't be pulled half way down the road. When she has a purpose she can go!! Well, have a great day and night! Enjoy your left overs!!! Glad the rained stopped for you. Muddy, wet dogs are no fun in the RV. Good for you for taking your china. I hate eating off paper plates and the China had to make it feel more festive. Am anxiously awaiting Roger's artwork.